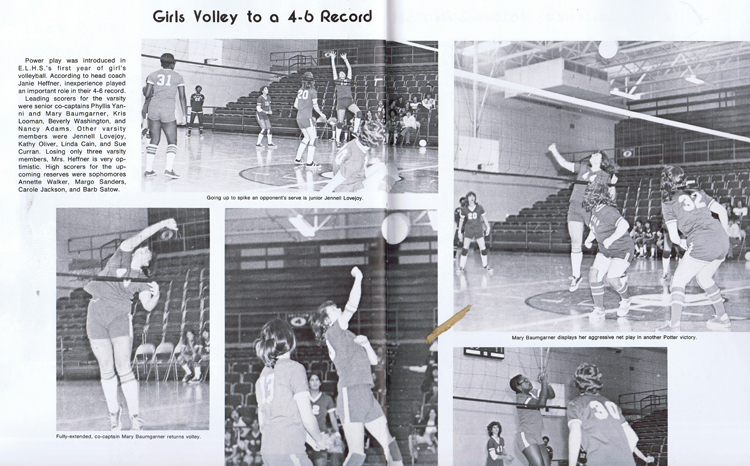 As stated above there were no inter-scholastic girls sports at ELHS from 1932-33 to 1973-74 school year. Nationally a few things took place that would help open the door once again to girls sports in High Schools including East Liverpool High School. Thus we define the modern era as beginning with 1973. There were some hiccups along the way as some of what follows shows. 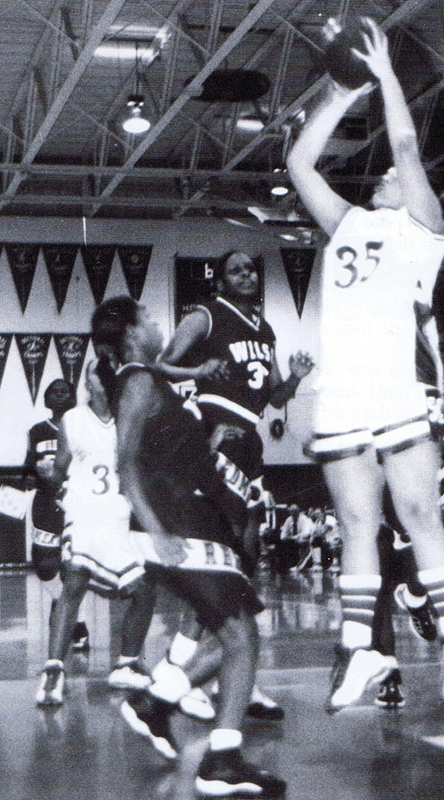 Title 9 was one of those few things took place that would help open the door once again to girls sports in ELHS. 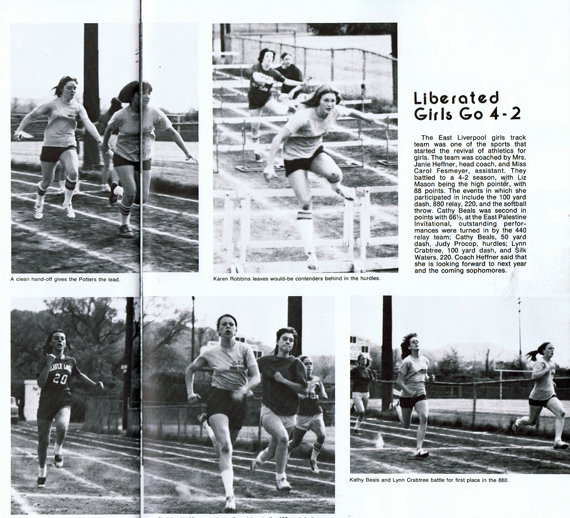 It was at the ELHS Athletic Board meeting in 1973 as to the role that girls sports would play in the inter-scholastic athletic program. Then High School Principal, Richard Meredith, advocated keeping them on the intramural level for financial reasons. I disagreed and said that before that happens, we should eliminate a boys sport to accommodate a girls basketball team. The board agreed and we've never looked back. 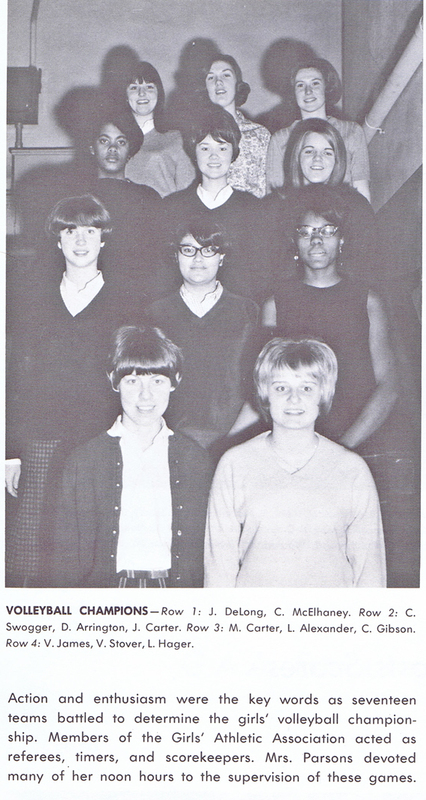 The first girls basketball team was in '74 and was coached by Carol Fesemyer. 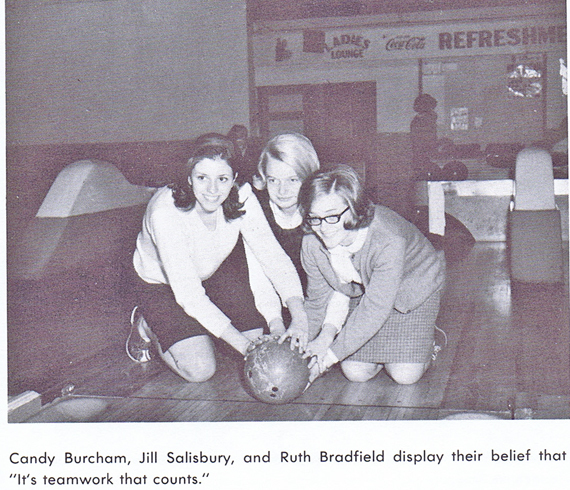 Members of that team were Patty (Frederick) Hoppel, Candy (McGeehan) Nicholson (comp tech at the Admin. bldg.). Candy has been inducted into the ELHS Athletic Hall of Fame. Successive girls BB coach was Becky Bailey. Bob Babish, then head football coach from '80-'83, was the first knowledgeable girls BB coach. In order that girls could participate in inter-scholastic sports and still be cheerleaders, several years ago we divided cheerleading into seasons allowing girls to cheer in one season while competing in sports in another. They can choose to be full-time cheerleaders if they so desire. Incidentally, in 1982, I created the Merrill D. Hall Award to be presented annually to the most outstanding senior female athlete and have been privileged to formally present it each year, since its creation, at senior assembly. Amy McCormack wanted to start girls fast-pitch softball and was encouraged to do so by her teacher, Bill Price, to come before the Athletic Board with a petition listing the girls interested in creating and playing on a softball team. She did so and with so much interest we readily agreed and girl's softball became an inter-scholastic sport. Amy McCormack became an early recipient of the Merrill D. Hall Award (established in 1982) presented annually to the most outstanding senior female athlete based on the acronym CLASS: Character- Leadership-Athletics- Sportsmanship and Scholarship. There are now 12 inter-scholastic teams on which girls may participate. For me, it has become a particular joy to watch these young ladies exhibited enthusiasm , assertiveness, aggressiveness and confidence heretofore hidden. A new dimension was added this year as girls' interscholastic athletics began a long-awaited comeback. The track team now included a girls track team for the first time and Volleyball became a varsity sport for the girls for the first time. 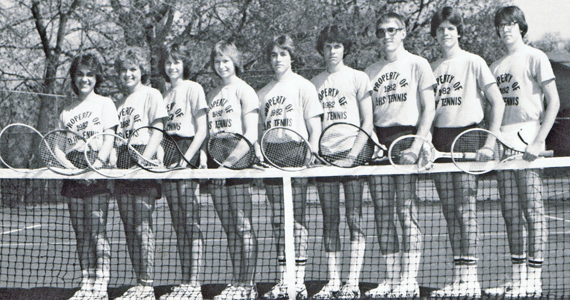 Brenda Payne did compete on the boys' tennis team, as did all other female tennis players. They therefore had to compete in the post season OHSAA boys tournament in accordance with the rules. 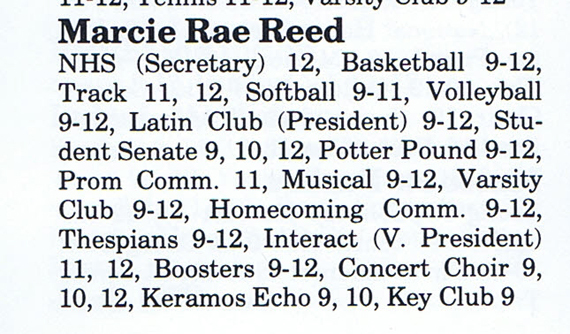 Brenda is also listed on the Varsity Basketball and Tennis team in the 1982 Keramos Yearbook. 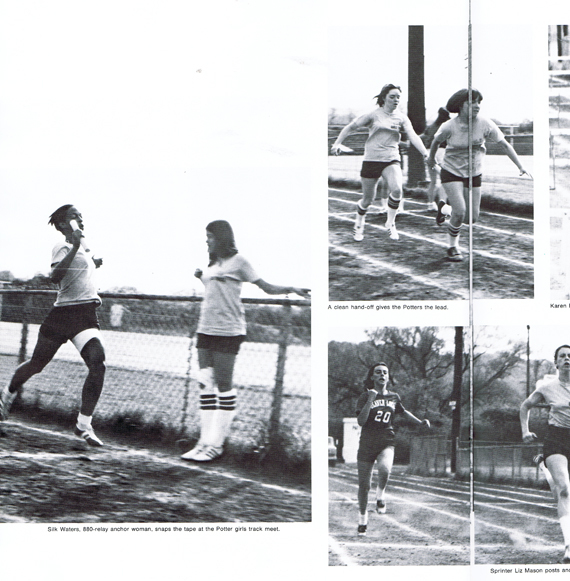 In 1978, our daughter, Monica, a 10th grader at ELHS (we were still a three (3) year high school) had logged more miles running in the summer prior to school starting than any member of the varsity cross-country team. At the first varsity cross-country meet, she was informed by the coach, Bill Price, that if she competed in this meet, since it was our only team and was listed as a "boys' team", she would be ineligible to compete in the post season OHSAA girls' tournament. She came to me in tears and informed me. I asked her what she wanted to do and she responded, "I want to run!" I told her to go run and that I would handle the situation. I called OHSAA and spoke with then commissioner, Bates, who informed me that if Monica competed with the boys she therefore enjoyed an unfair advantage and was ineligible to compete with the girls. I tried to impress on him not only that there were insufficient numbers of girls to have a separate team, but there were no girls teams anywhere in the area. He said, "That's the rule!" I told him, "It is obvious that you know nothing about female physiology or you would not be upholding such an outdated rule. You haven't heard the last from me." As a long time card carrying member of the ACLU, I called the Cleveland office and was informed that there was an organization which would relish this fight. The Women's Law Fund (endowed by the Ford Foundation) in Cleveland which was led by Ms. Jane Picker, a law professor at Cleveland State University. My wife, Monica and I met with a three member legal team led by Barbara Besser. They enthusiastically and aggressively lined up expert witnesses in preparation for this landmark Title Nine case filed in Federal District Court. Many trips to Cleveland were involved, much to our displeasure. The case was expedited since irreparable harm could result if Monica were denied participation and subsequently prevailed. Judge Green called the attorneys into his chambers and asked the defendants to explain Monica's options. OHSSA stated that she could compete with boys but would be required to compete in the boys' post season OHSAA tournament or she could sit out the season and compete in the girls' post season tournament. Having heard this the Judge said that these were not viable options and that the OHSAA should come to some agreement with the plaintiff. They came out of chambers and asked what we wanted. We told them that girls should be permitted to compete on boys' teams when there are numbers lacking to have a girls' team or there are no girls' teams to compete against and still be eligible to participate in the OHSAA post season girls' tournament. They readily agreed and thus it still exists as exception "4A" in the present rules and regulations of the OHSAA. Locally it is referred to as the "Monica Rule". Commissioner Bates approached me and said that he hoped that there were no hard feelings. I responded by saying, "You are a bunch of old men with your heads screwed on backward who don't have a clue about what is happening in the real world." Ms. Picker called me later to see if Brenda Payne would be willing to be the plaintiff in a similar suit as it applied to tennis. The Paynes had no desire to pursue it. One final irony. Columbiana County Common Pleas Judge, J. Warren Bettis, had a daughter on the all male Salem High team in a similar situation. You would have thought that he would have spearheaded such an injustice, however the best that I got from him was "Good luck!" wishes when I encountered him at a cross country meet where both his daughter and mine were competing. Monica was the first girl to earn varsity letters in each season possible (total 9), three each in cross-country, basketball and track and was selected team captain in each sport her senior year. A femural stress fracture prevented her from collegiate competition, but she obtained A CT certification as an athletic trainer and served successively as a grad assistant athletic trainer at OSU while pursuing her masters degree, head women's athletic trainer at KSU, Head athletic trainer for Columbus City schools and ultimately assistant athletic trainer at OSU. She left OSU to raise her family, but is often called upon to fill vacancies created by leaves of absence. Courtesy of Frank Dawson from his book: Picking Elderberries "A Small Town Story." 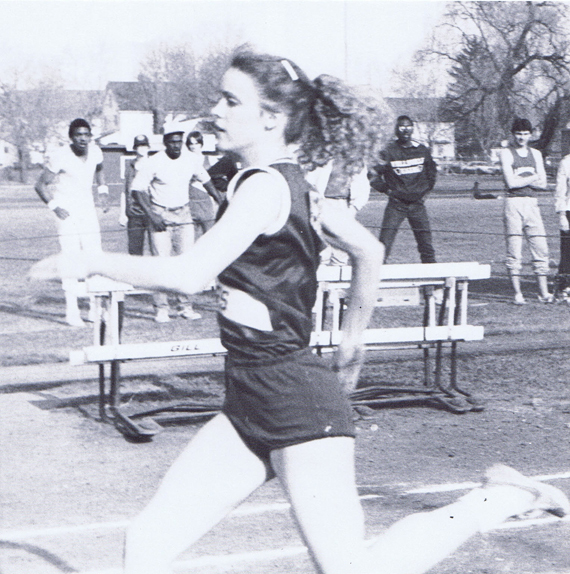 For a number of years, girls took a back seat to the boys at ELHS, until Leslie Palmer '77, burst on the scene by setting a State meet record in the 80-yard hurdles her senior year and later put up the seventh fastest time in the USA. while Lynn Wilson '85, Robin Sayre '86, Lori Bowersock '88, and Courtney Johnson '89, were each top all-around performers. 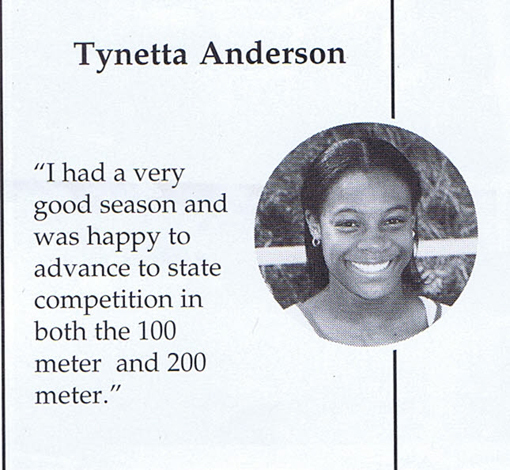 Tynetta Anderson '02, qualified twice for the state meet in the 100 and 200 meters, but was unable to grab the golden ring in Columbus. One female, Marci Reed '99, with 13 monograms, may have received the most varsity letters of any athlete ever to participate for the Potters. 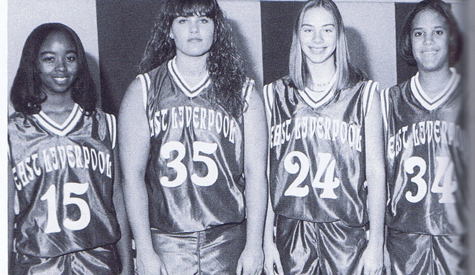 . .
Marcie Reed is second from the left, number 35 in the above pictures. All above pictures in this section are from Keramos Yearbooks. In the 40's, 50's and into the 60's, there were ample opportunities for boys to develop and hone whatever athletic abilities they may have. There was the usual pick up games on neighborhood playgrounds of basketball, in open fields for baseball and softball, almost any patch of grass for football, even the street. Boys even played "throw up and kill" style football games at recess in elementary school on the school playgrounds. There were organized forms of sport for boys, church league softball teams, various levels of baseball for the boys. Girls didn't have most of that so that is what we are looking for in this segment about ELHS Sports. How did girls growing up in the late 50's 60's and 70's develop their skills etc., that enabled them to play varsity sports in High School beginning with the 1973-74 school year. We do understand from a interview with Dr. Robin Sayre-Pietryk, which you will be able to read in that section on her, that in the early 70's girls in school were told they could sign up to play baseball with the boys. 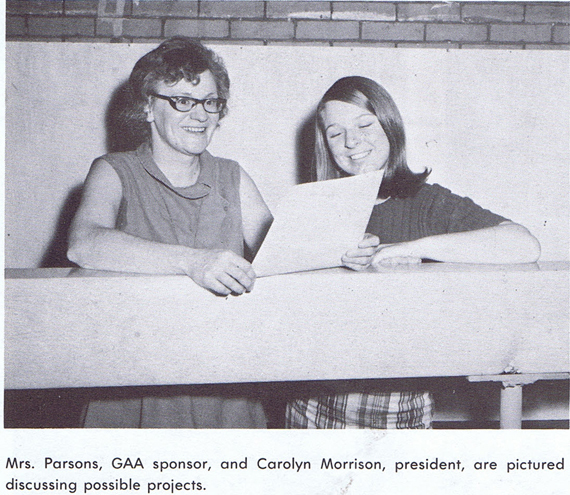 The Girls Athletic Association (GAA) was McKinley’s sports answer for the female jocks. Many of us had played volleyball, softball and basketball at our elementary schools and churches. We also danced and jumped rope to keep our athletic ability alive before women’s sports received the universal recognition it does today. At McKinley we met after school on Tuesdays and Thursdays to play either volleyball or basketball depending on the season. It was called intramurals, meaning we had no outside competition like the boys did in football and other mainstream sports to play arch rivals at other schools. Each season we voted for team captains and some of it was by athletic skills but most of it was by popularity. Then the team captains chose us just like they did on the playgrounds. How embarrassing to be chosen last, but it always happened to some of us. And if you were separated from your own friends, too bad. As a freshman and a sophomore I idolized my team captains because they were always juniors and seniors. At the first McKinley Alumni luncheon I attended, I spoke to Marilyn Padfield and Donna Brandon who were both team captains when I was a lowly freshman. I thought I was in celebrity heaven. Intramural sports in high school, in the form of basketball, existed for girls as far back as the early 1915. At some point along the way volleyball was added as well. In the school year 1966-67 the G.A.A. had a bowling league, gymnastics and volleyball. No mention of basketball. 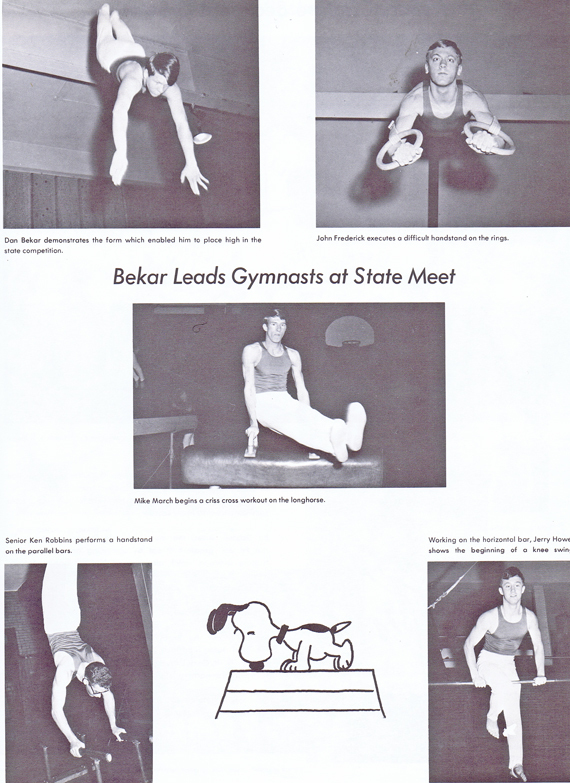 It appears that for the boys gymnastics, at least for this year, was a interscholastic sport. We will look to see if we can find any mention of the G.A. A. in any other yearbooks. A former AD arbitrarily decided in those years when no award was presented that no one qualified. "His" criteria required that eligibility necessitated that any nominee had to be a two or more sport participant. No such requirement has ever existed. That former AD did a great disservice to some outstanding female athletes. We are still missing a few names. If anyone knows who they might be please notify us. As of this date, Monday, May 7, 2012, a complete list of Lady Potters in the ELHS Athletic HOF. LADY POTTERS WHO HAVE BEEN INDUCTED INTO MORE THAN ONE ATHLETIC HOF. Dr. Robin Sayre-Pietryk, ELHS Athletic HOF, Bethany College Athletic HOF. It has been brought to our attention that Dr. Robin Sayre-Pietryk is being inducted into the Bethany College Athletic Hall Of Fame during Bethany College Homecoming Weekend, September 27-28, 2013. Robin Sayre-Pietryk is a 1986 graduate of ELHS and a member of the ELHS Athletic Hall Of Fame. Apparently she was nominated this past winter. We were informed that the Athletic Director at Bethany College told her that it was long over due, that it was a unanimous selection made more remarkable since it was her first time on the ballot. Robin attended Bethany College from 1986 -1989. Still searching for the other dates. THey will be added as found. Anyone who knows the date we would appreciate if they contacted us. Swimming - 2000 No swim teams in 2002-03 resumed in 2004 again. Bowling - 2011-2012 Formed with both a Girls team and Boys team. Wendy Baker: Perhaps the best Lady Potter in history. 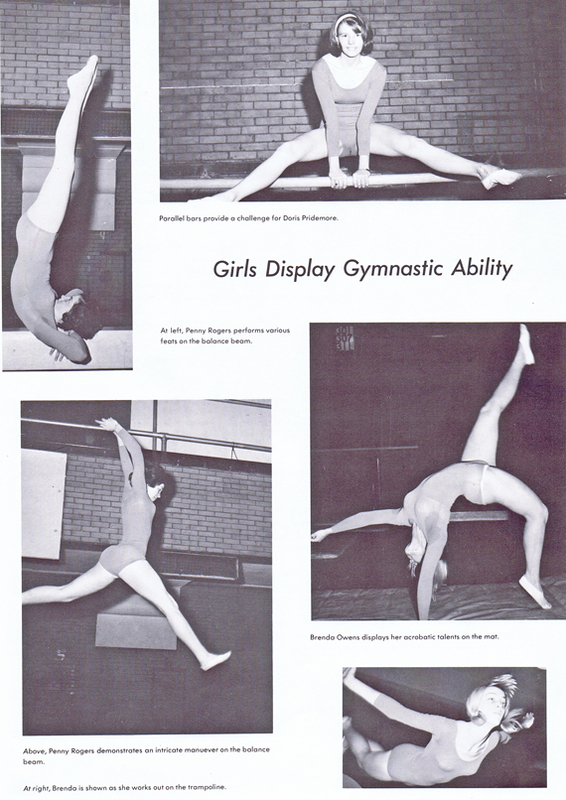 An interview with Monica Hoschar-Baugh, Class of 1981: My "unique training" methods. An Interview with Dr. Robin Sayre-Pietryk, Class of 1986: Growing up, From "Tomboy" to Successful Head Women's Volleyball Coach at a Div III College. An interview with Amy McCormack: Class of 1984, An interview with Amy McCormack. Successful first year for Lady Potters. Lady Potters, History Making, Softball. This section is very much a work in progress. Anyone who knows of anyone who should be added to this list please let us know. Thank you. Dr. Robin Sayre-Pietryk, EL, Assistant Girls Basketball Coach. Dr. Robin Sayre-Pietryk, EL, Softball. Katie Smith, EL, Girls Soccer. Courtney Johnson, Buckeye Valley High School, Softball. Courtney Johnson, Buckeye Valley High School. Volleyball. Dr. Robin Sayre-Pietryk, Defiance College, Volleyball. Dr. Robin Sayre-Pietryk, North Carolina Wesleyan College, Volleyball. She completed her 14th year at NC Wesleyan College in 2013. She is winningest volleyball coach at NC Wesleyan, 232 -190 Record. We are interested in doing more interviews with former and present Lady Potters. If interested contact us. Suggestions for additional people or information for this article are welcome. Any errors that are noted we would appreciate being told about.